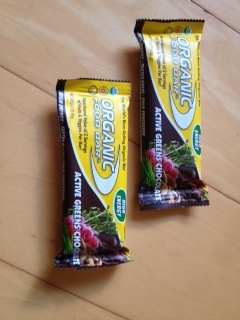 If you want a vegan chocolate bar that tastes good and is good for you, as far as chocolate bars go, give Active Greens Chocolate by Organic Food Bar a try. The ingredients are all organic. It contains: almond butter, dates, agave, brown rice protein, evaporated cane juice (sugar), dark chocolate chips, raisins, sprouts, wheat and barley grass powder, sesame seeds, spirulina, broccoli sprouts, blueberries, raspberries, and carrot juice. The wrapper has “high energy” on the front because it’s high calorie at 310 calories for one bar. Either have it as a meal replacement when you’re on the go or split it in two, and have half mid-morning and the rest mid-afternoon. Enjoy!